Archeologists have established that humans have been purposefully making glass objects for utilitarian and adornment purposes for thousands of years with ancient Egypt and Mesopotamia, followed by Rome, being centers for advancement of these art forms. Glass art techniques are many: blown glass, stained glass, cast glass, fused and slumped glass, etching, and glass mosaic to name a few. These art forms developed over the ages and their prominence waxed and waned as new techniques and technologies were developed. 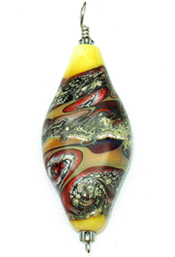 What is now Murano, Italy, became a center for glass art as far back as the 9th century. Today, even though there are now more glass artists working in Seattle than in Murano, it is that Venetian island that is still held to be the birthplace and center of modern glass art. Today, many glass manufacturers produce specialty glasses to satisfy the needs of artists by producing a huge palette of colors and by precise quality control in production. While the availability of art quality glass and techniques has changed over the centuries, the basic method of creating art with glass has not. For most glass art, the artist needs a supply of compatible glass and a source of heat. Depending upon the technique used, the source of heat can be a furnace, a kiln, a torch, or a combination of these. Depending upon the technique being employed, working temperatures range from 1,100 to 2,400 degrees Fahrenheit. Compatibility of glass refers to the rate of expansion and contraction as the glass is heated and cooled. Compatibility followed by annealing, or controlled cooling, of the glass is critical to ensure stability and durability of the finished piece. Work can crack or break in the kiln (or even months after coming out of the kiln) if it is not properly cooled. Annealing times of one to two months, or more, are not unusual in very large pieces. Depending upon the techniques to be utilized, setting up, equipping, and supplying a glass art studio requires an investment from thousands to tens of thousands of dollars.